This past September, the City of Monticello Wastewater Treatment Plant (WWTP) was the site of a Lunch and Learn, as well as a comprehensive tour of the new and improved plant that was last upgraded 17 years ago. The event was hosted by the Indiana Water Environment Association Residuals and Resource Recovery Committee and the City's Wastewater Superintendent, Adam Downey. 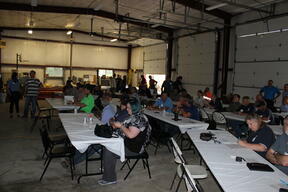 The Lunch and Learn included presentations on the various aspects and details of the improved plant. The included video highlights the day's activities and shows off some of the new improvements. Dozens were in attendance for presentations on the new upgrades, which include a 30 MGD (Million Gallons per Day) multi-rake fine screen to handle normal WWTP flows as well as screening of Combined Sewer Overflows (CSOs); raw sewage lift station; and vortex grit removal system prior to the new biological treatment process. Although Biological Nutrient Removal (BNR) is utilized in other parts of the country, Monticello’s AquaPASS® is the first in Indiana, and one of the first three in the United States. The new BNR system utilizes enhanced treatment strategies that allow for both nitrification and denitrification. Preliminary data shows that the new system can reliably achieve a 98% or greater reduction in ammonia-nitrogen, and 85% or greater reduction in total-nitrogen. The previous facility, as well as the majority of the WWTP’s in Indiana, achieve total-nitrogen reduction of only 30-60%. Not only is this system producing a higher quality discharge, but is doing so with less energy. Preliminary data shows a 20% decrease in power consumption for the overall WWTP just by controlling aeration blowers and taking advantage of anoxic cycling compared to uncontrolled continuous aeration. 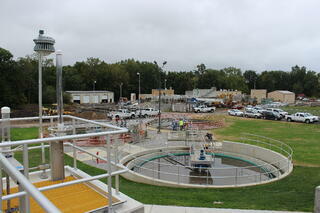 The upgraded Monticello WWTP is a symbol of pride for the community. While the customers had to absorb a rate increase of over 50% for the construction of the WWTP and a new interceptor sewer and force main closely connected to the project, very little negative feedback was observed. In addition to providing a cleaner environment with upgraded wastewater treatment and fewer CSO events, the work ensures that one of the City’s major draws, Lake Freeman, will be positively impacted as well. Additionally, the increased treatment capacity will allow for future economic and residential growth for the Twin Lakes area.